Since Microsoft released the minimal system requirements that are a lot higher (https://azure.microsoft.com/en-us/documentation/articles/azure-stack-deploy/) I saw this as a real challenge. The first time I tried it failed miserably but the second time was a great success. After I downloaded all the files the files for the Technical Preview I created a new VM within Hyper-V based on the virtual hard drive “WindowsServer2016Datacenter.vhdx” that was in the set of you downloaded. 3 Additional Data drives dynamically expanding. What already might come to mind is the following: Can I use Hyper-V within a Hyper VM machine (Nested Virtualization). The answer is “Yes” if you are running Insider builds of for example Windows 10. In the insider builds there is a early preview feature called Nested Virtualization. It is available if you are running Build 10565 or later, and comes with no performance or stability guarantees. I performed the following PowerShell script from my client machine with the VM running. ~/Enable-NestedVm.ps1 -VmName "Windows 2016 TP 4 - Azure Stack Host"
Note: When using Nested Virtualization you can not use dynamic memory. In order to install Azure Stack on minimal hardware some setup files need to be adjusted. In order to make these adjustments Mount the virtual drive called: “MicrosoftAzureStackPOC.vhdx”. On this drive the prerequisites check needs to be changed. The prerequisites checks the amount of memory in the PC. The amount can not be less then 64 GB. If you do not change the PowerShell file and you do not have sufficient amount of memory you will encounter the following error. 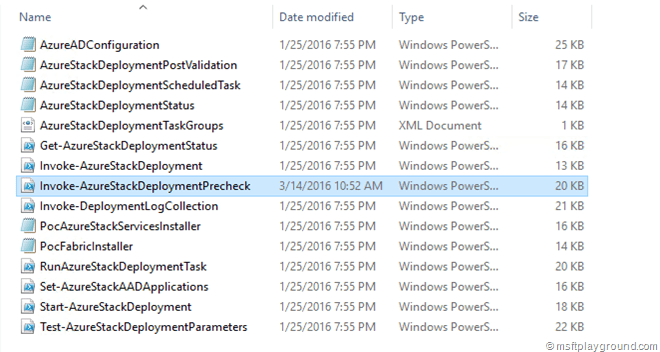 In order to skip or pass this step the PowerShell that executes the prerequisites needs to be adjusted. throw "Check system memory requirement failed. At least 64GB physical memory is required." Change it to the minimum amount of memory your machine will use. This is not the only change you need to make when you want to run Azure Stack on minimal memory. The Azure Service Fabric installer will configure a couple (10) of machines with a specific amount of memory. Running all these machines together will not work on the amount of memory so the configuration needs to be changed. The configuration for these machines can be adjusted within a file called “PoCFabricSettings.xml” that you can find in the folder “Drive:\AzureStackInstaller\PoCFabricInstaller”. Every VM that will be created during the installation has a configuration element in this file. In order to get it running on my Hardware I needed to adjust the some elements for all machines to the values below. When the setup files are adjusted the drive can be unmounted and all files from the bits can be copied to the newly created VM. When you login to the VM you need to run a PowerShell window as Administrator and start the “DeployAzureStack.ps1” file for the installation. I suggest running the script with the verbose parameter to get some more information during the installation. If something looks strange or something went wrong during the installation you can check the log files. The log files are located in the following ProgramData folder. After the prerequisites are passed the installation will continue and ask you to login in to a Azure Active Directory tenant. When the login is successful and you confirm you want to attach Azure Stack to this Azure Active Directory the installation of the Azure Stack POC will begin. When the installation is done is will show the below message. On my VM the installation took about 4 hours. 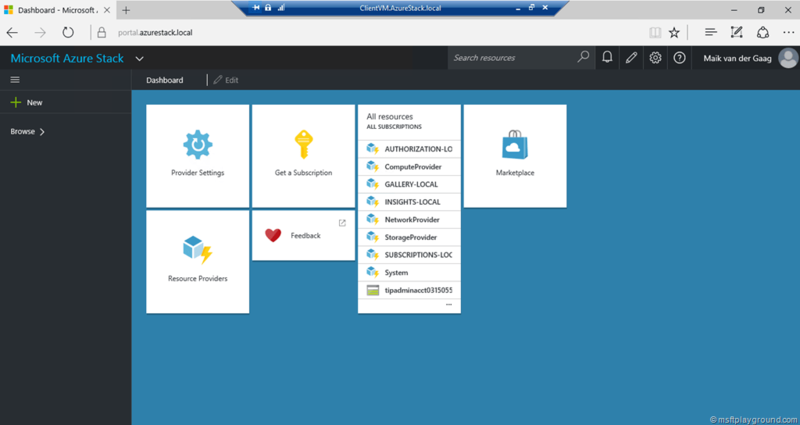 Opening the Client VM and the Azure Stack Portal link will lead to the following URL: https://portal.azurestack.local/ with your own Azure Portal. any advise for TP2 ? Not tried the TP2 yet, you should try to find the configuration settings for the machines. When I have time I will try to get it installed! I ‘ve been scratching my head but couldn’t find out which files to be tweaked. If you get time please update your blog post. Thanks. Would this work with 48GB’s of Ram and only a 270GB Hard disk? I think it would, you only need to change the configuration of the vm’s to make it possible. Perhaps you would need a external hard drive. since ASDK launched, some of the files have changed around – have you found this setting file in the ASDK release? Nope, haven’t played with that version yet. I used it for the actual ASDK release.